LOST: Canada, BC. 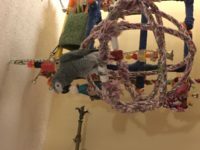 Kelowna – Congo African Grey “Perri” Feb 01-19 – REUNITED! Missing African Grey Parrot 6yrs old. His name is Perri, he does talk, loves to make bomb explosion noises too. He has a 150+ word vocabulary. He is microchipped & dearly loved. He does Not pluck his feathers. His wings are clipped to glide but unfortunately he caught a bit of wind when he flew off my deck. I live in Scotty creek area of Ellison on the top of Daryl Rd. I was outside taking pictures on my deck, I came in with my hands full and did not see him when I opened the glass door. I quickly emptied my hand went to pick him up and block flight he pushed off my arm and glided off my deck down towards a neighbors roof. Then caught some wind and headed over the field of ellison elementary. He turned left and glided down in Ellison, Scotty creek home area. Common phrases he uses: Let go for a break, let’s go take a shower, what’s going on, periwinkles, let’s go camping, wanna go camping, can I go on your shoulder, want chicken, let’s go bye bye, Sorry Mama….he says my name Heather or mama…he laughs, he coughs , makes FaceTime rings, phone rings, microwave button sounds and those are just a few. He is not free flight trained. He could not have gotten far since he is clipped to only glide. I live in an area where there is a small residential section amongst large farms and orchards. When I saw him decending he seemed to be still in residential area but because I lost view from trees I can not be sure. I searched everywhere possible that I believe he could have reached gliding except for backyards I can not access and 2 private farm properties I could not enter to search.